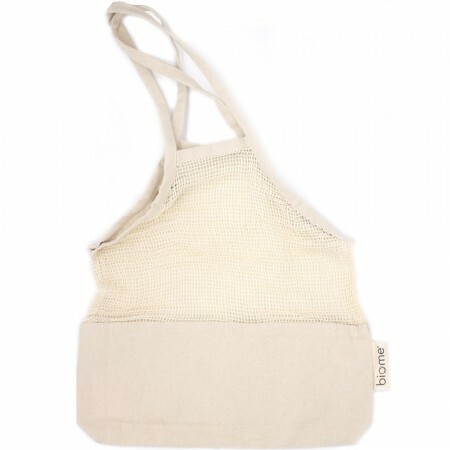 A twist on the traditional and popular string carry bag, with a solid canvas base to stop small items falling through the mesh, and to give a little privacy for the contents. Made from 100% GOTS certified organic cotton. A great plastic free shopping alternative. Lightweight mesh material, with sturdy canvas base. Can be used as a casual day bag, or for produce shopping. Mesh bags allow produce to 'breathe' and last longer. Machine washable. Wash separately in warm water with environmentally friendly laundry detergent. 39 (L) x 5.5 (W) cm (for canvas base), 28 (H) cm (to the low shoulder). Plus handles approx 26 cm. Browse our other reusable bags.